The Benko sisters are well on their way in the tennis world. Lorren, 11 and Heather, 10, began taking lessons with Jacques Joyal in 2009. Parents Jana and Stefan credit the training under Jacques as a valuable stepping stone in their daughters’ progress. 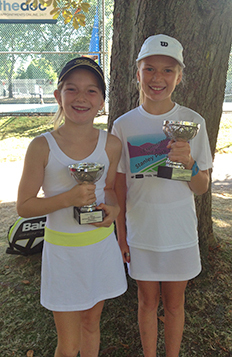 In 2013 they both competed in the Future Stars Tour, a progressive Tennis Canada competition for players under 10. Heather garnered a first place finish and Lorren placed second. In the provincials that year they both advanced to second rounds in singles and were second in the ‘Under 10’ doubles category. Their success ensured them a place in provincial tennis programs where they train under a variety of national coaches. They still attend clinics year round at SRC with Coach Jacques.